"Without the aid of NCCS, we would not be able to get the healthcare treatment our daughter requires to stay alive and continue with her amazing quality of life." When Dakota Jade Neblock was born October 29, 2005, parents Nick Neblock and Stephanie Cotton were just beginning their life together. They enjoyed three short, perfect months with their newborn child before a routine physical proved abnormal. For this family, the battle with cancer began early when Dakota was diagnosed with Stage IV, High-Risk Neuroblastoma. For the majority of this vibrant young child's life, she has been receiving treatment to combat the two relapses she's experienced since the original diagnosis. After two-and-a-half years, Dakota's doctors made it clear that she needed to seek treatment with specialists outside of her hometown. "Following her second relapse, it became very obvious that the standard therapies for her type of cancer were no longer going to benefit her," Stephanie said. So, for the next four years Nick, Stephanie and Dakota traveled from their home in Iowa to Memorial Sloan Kettering Cancer Center in New York City where Dakota endured multiple surgeries, high-dose chemotherapies, and radiation. "The NCCS helped relieve some of the financial burden by helping us with lodging, airfare, and meals," said the Stephanie. Success was somewhat achieved when Dakota began participating in clinical trials that were not offered anywhere else in the U.S except at Memorial Sloan Kettering. These procedures helped reduce the cancer in Dakota's body, although she still struggles with some disease in her pelvic bones. She continues to participate in a low-dose maintenance chemotherapy clinical trial, but that hasn't stopped this bubbly, now six-and-a-half year old. 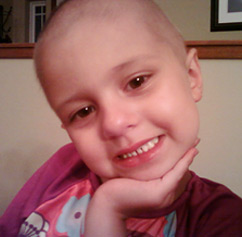 Like other children her age, Dakota attends kindergarten on a daily basis, is making friends, and feeling healthy. To ensure the treatment's continued success, the Neblock family still travels from Iowa to New York every eight weeks for follow-up appointments and testing. "NCCS helps us tremendously by assisting with airfare, meals, gas, and cab costs while we are traveling," said Stephanie. "Without the aid of NCCS, we would not be able to get the healthcare treatment our daughter requires to stay alive and continue with her amazing quality of life." Nick and Stephanie remain optimistic about their daughter's prognosis, fueled mostly by prayers from family and friends and their daughter's unfailing sense of optimism.